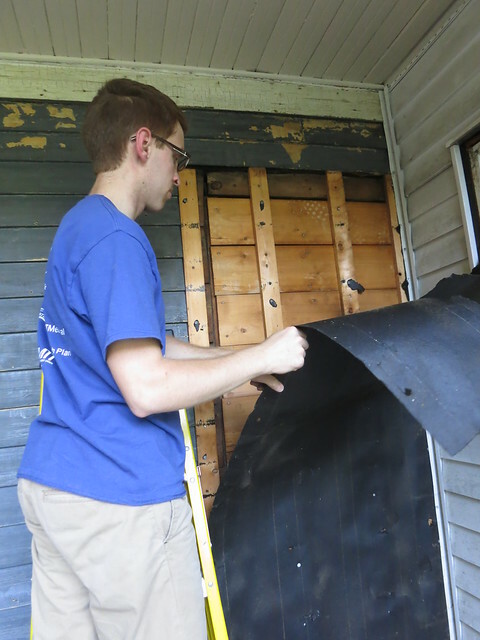 Yes, we found a new door. Last weekend a good friend of ours, Carl! came over to help with the house. He worked as a house painter for several summers and has some experience with it. He is what we like to call “fun-employed” and is doing some house work for us. 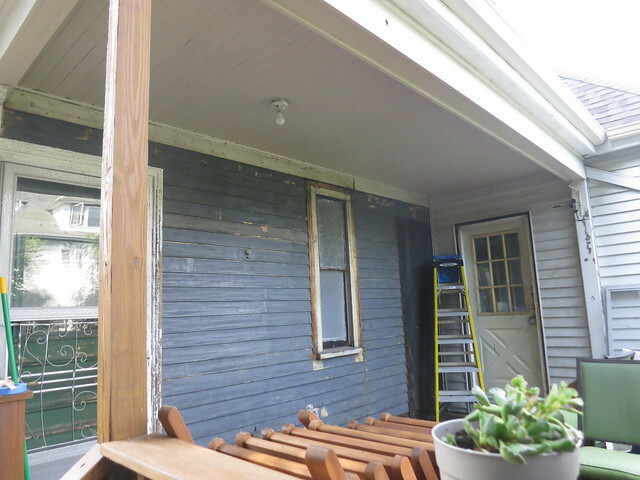 Under the siding was a mixture of tar paper and some aluminum backing stuff. This really was great news because it really protected the wood siding underneath. hey look, the house is blue!! huh…a door? I guess there was a door there at some point and they filled it in and put the aluminum siding over it. 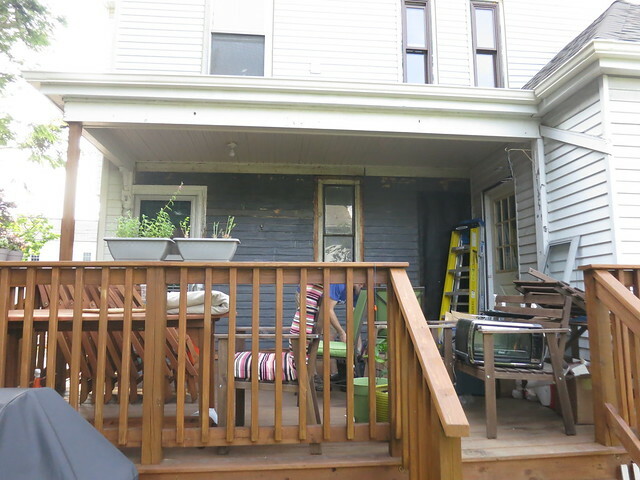 This really throws some more questions at the original floorplan and we’ll need to replace that bit of siding. In other bad news, take a look at the window. 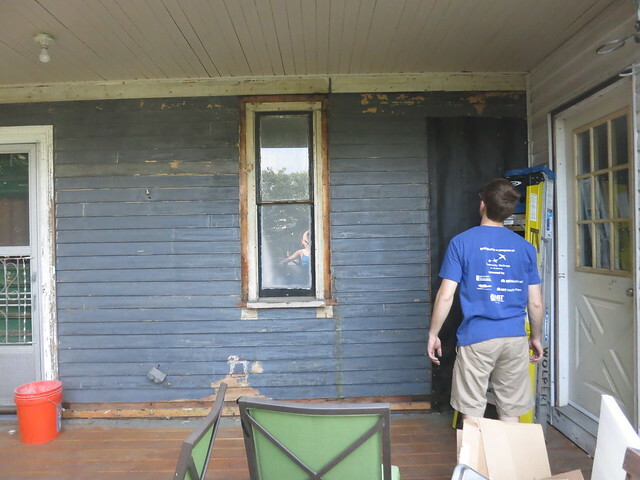 You can see there was some decorative molding around the window that was pulled off. 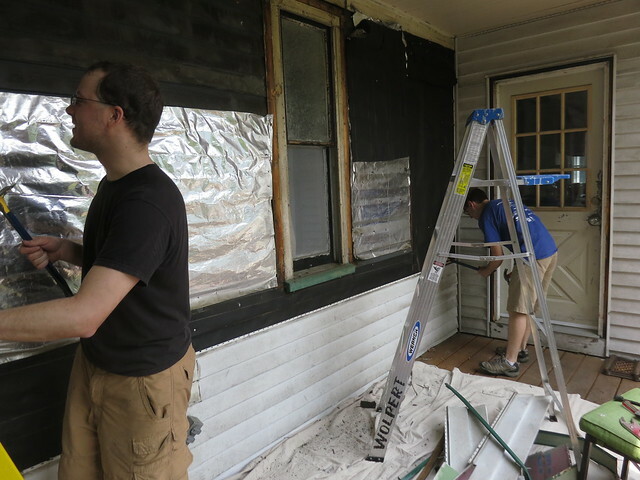 The sil of the window was also chopped off on the ends so that the aluminum window flashing would fit around the window. We’re planning on patching the notched corners of the sil and putting some molding back up. We have a great local molding place that is probably the place where all the molding from the house came from 100 years ago. Old places are so cool! Anyways, we should be able to get something similar to what was up there. The door to the left of the window still has the molding so we’ll use that as our best guess for what was up originally. The wood siding looks so much better even though it’s just in that one area and hasn’t been painted yet. Carl! spent several hours scraping it (glad it wasn’t me!) so it’s ready for paint. We’re going to pressure wash it this weekend and then prime and paint it. I’m so excited!! Just having color on the house make it look about 100 times better. Talk about curb appeal! I’m hoping we can get some tinted primer up this weekend so we’ll get a good idea of the color. Are you as excited as I am? I hope not…that’s be kinda weird..
Anywho, I’ll keep you posted! FANTASTIC! 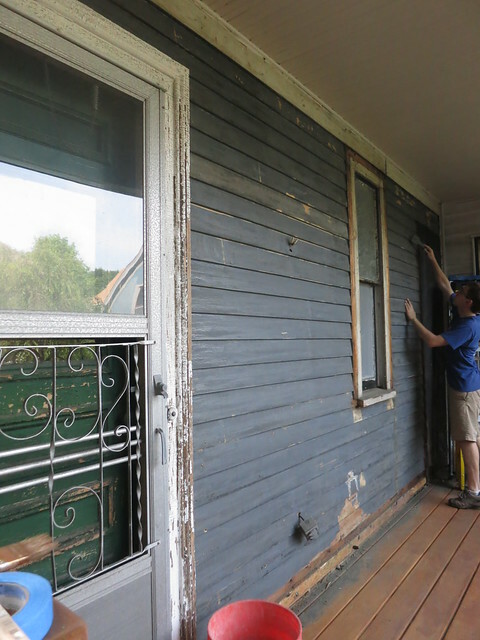 As you know I was itching to pull the siding off, but a bit apprehensive, This will make such a difference. It’ll be the best looking house in the area!